Competition version of Fiat's Miata-based Spider comes with 300 hp and a Gravel Kit. 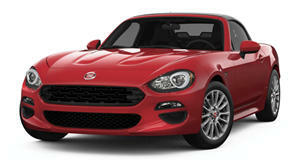 The may not be as "super” a sports car as some other Italian roadsters, but its sporting character is no pretension. In fact the performance brand even produces a rally version, and the automaker's just updated it for the season ahead. Called the , the competition model is based closely on the road-going version (which itself is based on the ), but upgraded to the FIA's production-derived R-GT regulations. To that end, the standard engine is replaced by a 1.8-liter turbo four producing 296 horsepower – nearly double the showroom stock. Following extensive testing and actual competition, the Abarth team has retuned the engine for a more linear torque curve and lower-end response. It also reworked the adjustable locking differential for better traction, the gearbox for smoother shifting, and the suspension setup for more flexibility across the varied surfaces on which rally cars have to carry pace. Fiat's performance division also developed a new Gravel Kit that raises the ride height by 40 mm (about an inch and a half) on smaller 15-inch wheels (instead of the usual 18s) – the better to clock blistering stage times on the loose stuff. Last year the Abarth 124 Spider Rally positively dominated the FIA R-GT Cup, locking out the podiums at all but one round. Against a field of eight Fiats, three Porsche 997 GT3s yielded one solitary third-place class finish in the Czech round.